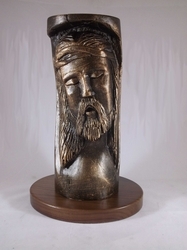 Jesus Face Carved In Log by Julian Garcia is an outstanding piece of Christian sculpture that would make a wonderful addition to any church or home décor setting. "Seek the Lord and His strength; Seek His face evermore!" This beautiful piece of Christian art was molded from an original wood carving by Julian Garcia. It measures 10Hx4Wx4D.